Following and exhaustive evaluation process lasting several days, the JALAS Zenit convinced the international expert jury of the “red dot award: product design 2012, to award it one of the coveted awards, assigned by a 30-member expert jury. Creative heads and manufacturers from all over the world had submitted 4,515 designs altogether to the renowned product competition. With its high design quality, JALAS Zenit inspired the experts. It received the globally sought-after red dot for its fine design language in the product category 12. 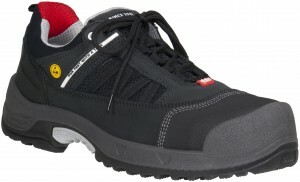 JALAS Zenit is an elegant and lightweight safety shoe with excellent protective characteristics. The design is elegant and modern. – “ When we created Jalas Zenit in collaboration with the Swedish design agency Ergonomidesign, we used new technology and a new way of thinking – we wanted a shoe with the best possible protection features, comfortable and also stylish and modern. We succeeded.” says Marcus Ejendal Vice President at Ejendals group. This is the second time Ejendals has won the prestigious award. In 2007, the TEGERA PRO gloves with wrist support were awarded the red dot design award “best of the best”. The TEGERA PRO product range was developed with focus on usability, design and quality – revolutionizing the standard in PPE for hands and placing TEGERA PRO as the leading brand on the Northern European market. Over one and half a million gloves sold last year speaks loud and clear. The red dot design award, whose origins reach back to the 1950s, is carried out in three disciplines: the “red dot award: product design”, the “red dot award: communication design” and the “red dot award: design concept”. In 2011 alone, more than 14,000 entries from over 70 countries were registered. The award – the red dot – has established itself internationally as one of the most appreciated quality seals for outstanding designs.